When night fell, I found myself yet again in an Ethiopian taxi and heading for the unknown. Ten minutes later we arrived at a wooded area on the outskirts of Harar. A few local men were hanging around, but they took little notice of our arrival. Their silence was respectful, reverent. Their gaze focused and fixed. It was all very disconcerting. They were looking towards the trees, but at what? With the taxi lights turned off, the darkness was absolute. As my eyes adjusted to the black, I made out the form of the 'hyena man' sitting on the ground - a small bag by his side. This, my guide whispered, was full of entrails and offal. We waited and watched, joining the hyena man in quiet contemplation. Then with a jolt, the silence was broken by an eerie, guttural chant - a half-human call to summon the distinctly non-human. I looked over at the locals --their mouths open, their bodies locked in anticipation. I looked back into the darkness. A lean and seemingly weightless creature glided out of the woods and straight towards us. The taxi driver switched on his low beam and the hyena lurched and stopped; its eyes reflecting back our fear. I could hear my blood pumping but nothing else. Time slowed, along with my breath. In a second it was all over. 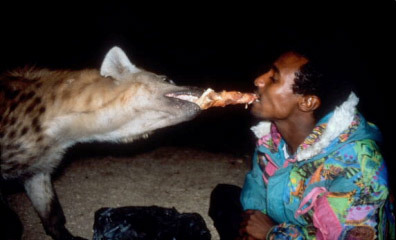 The meat was gone - and so was the hyena.